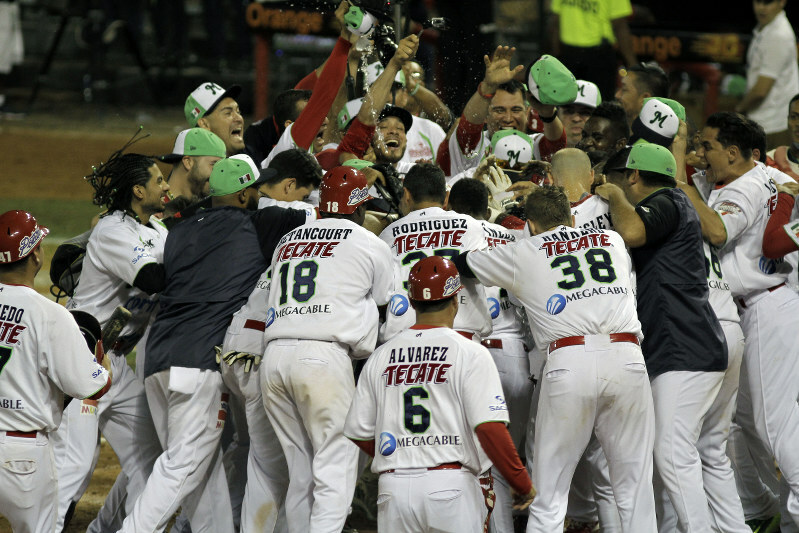 Mexico players celebrate after winning the Caribbean Series baseball final, in Santo Domingo, Dominican Republic, on Feb. 7, 2016. SANTO DOMINGO, Dominican Republic (AP) -- Jorge Vazquez hit a home run to lead off the bottom of the ninth inning Sunday, lifting Mexico's Mazatlan Venados to a 5-4 comeback victory over Venezuela's Aragua Tigres for the Caribbean Series championship. It was Mexico's third title in four years. "We never gave up. We always battled to the fullest and kept our heads up, so today we celebrate this crown," said Mexico coach Juan Jose Pacho, whose team won all six games it played in the tournament. Mexico took an early 2-0 lead, but Venezuela came back with two runs in the fifth inning and two more in the seventh to grab the lead. In the bottom of the seventh, Venados' Sebastien Valle drove in two runs to tie it. Mexico held Venezuela scoreless the next two innings, giving Vazquez the chance to win the game. Venezuela's only two losses in the series were to Mexico. "That's baseball," Venezuela coach Eduardo Perez said. "We played hard and gave everything on the field. Congratulations to Mexico because they did a great job and are worthy champions." Mexico reliever Steven Hensley was credited with the win after coming in to retire Venezuela's final batter in the top of the ninth. Starter Eddy Gamboa pitched six innings, giving up nine hits and four runs -- two earned. Renee Cortez took the loss for Venezuela, pitching two-thirds of an inning. Starter Freddy Garcia gave up four hits and two earned runs over 5 1/3 innings. For Venezuela, Hernan Perez went 3-for-4 with a homerun and two RBIs, and Sandy Leon was 3-for-3 and scored a run.